Cytotoxic T cells and macrophages contribute to beta cell destruction in type 1 diabetes at least in part through the production of cytokines such as IL-1β, IFN-γ and TNF-α. We have recently shown the IL-17 pathway to be activated in circulating T cells and pancreatic islets of type 1 diabetes patients. Here, we studied whether IL-17A upregulates the production of chemokines by human pancreatic islets, thus contributing to the build-up of insulitis. Human islets (from 18 donors), INS-1E cells and islets from wild-type and Stat1 knockout mice were studied. Dispersed islet cells were left untreated, or were treated with IL-17A alone or together with IL-1β+IFN-γ or TNF-α+IFN-γ. RNA interference was used to knock down signal transducer and activator of transcription 1 (STAT1). Chemokine expression was assessed by quantitative RT-PCR, ELISA and histology. Cell viability was evaluated with nuclear dyes. IL-17A augmented IL-1β+IFN-γ- and TNF-α+IFN-γ-induced chemokine mRNA and protein expression, and apoptosis in human islets. Beta cells were at least in part the source of chemokine production. Knockdown of STAT1 in human islets prevented cytokine- or IL-17A+cytokine-induced apoptosis and the expression of particular chemokines, e.g. chemokine (C-X-C motif) ligands 9 and 10. Similar observations were made in islets isolated from Stat1 knockout mice. Our findings indicate that IL-17A exacerbates proinflammatory chemokine expression and secretion by human islets exposed to cytokines. This suggests that IL-17A contributes to the pathogenesis of type 1 diabetes by two mechanisms, namely the exacerbation of beta cell apoptosis and increased local production of chemokines, thus potentially aggravating insulitis. The online version of this article (doi: 10.1007/s00125-013-3135-2) contains peer-reviewed but unedited supplementary material, which is available to authorised users. Pancreatic beta cells, like neurons and other non-immune cell types, have a vigorous cellular self-defence or cell-autonomous immunity, which contributes to defence against infections (mostly viral) and leads to local inflammation [1, 2]. Key steps of the beta cell-autonomous immune response are regulated by candidate genes for type 1 diabetes, including viral recognition, regulation of inflammation and cross-talk with the adaptive immune response [3, 4, 5]. Excessive pancreatic beta cell-autonomous immunity, in crosstalk with endoplasmic reticulum stress and other signals, exacerbates inflammation, beta cell apoptosis and the progression to type 1 diabetes . The triggering of the full autoimmune response in type 1 diabetes probably depends on a ‘dialogue’ between beta cells and the immune system, regulated by the local release of chemokines and cytokines, which attract and stimulate cells of the immune system such as macrophages and cytotoxic T lymphocytes [7, 8, 9]. These cells contribute to selective beta cell destruction both directly and via the production of proinflammatory cytokines such as IL-1β, IFN-γ and TNF-α . The production of chemokines by pancreatic islets takes place in response to ‘danger signals’, such as a viral infection, or following signals provided by dying cells, IL-1β+IFN-γ and TNF-α+IFN-γ [2, 7, 10]. Chemokine expression is also present in islets from type 1 diabetic patients, confirming the clinical relevance of these experimental observations . As insulitis progresses, the nature of local invasion by immune cells probably changes, with an increased contribution by IL-17-secreting CD4+ T cells (T helper [Th] cell 17), together with Th1 cells. Th17 cells have been implicated in several autoimmune diseases, including multiple sclerosis, psoriasis, inflammatory bowel disease and rheumatoid arthritis. Th17 cells produce the cytokine IL-17A, which is also produced by dendritic cells, macrophages and natural killer cells [12, 13, 14]. Neutralisation of IL-17A prevents diabetes in NOD mice when started at 10 weeks of age . 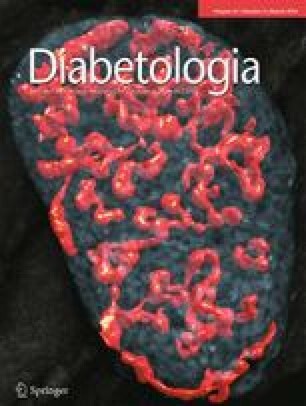 Moreover, circulating IL-17+ and beta cell-specific autoreactive CD4+ cells are present in the circulation of type 1 diabetes patients at diagnosis [16, 17] and are associated with diabetes in NOD mice . Importantly, increased expression of IL-17A was detected in the islets of a recently diagnosed type 1 diabetic patient  and increased numbers of Th17 cells are present in pancreatic lymph nodes of patients with long-term type 1 diabetes . IL-17A enhances IL-1β+IFN-γ- or TNF-α+IFN-γ-induced apoptosis in rodent and human beta cells [16, 17, 20] and IL-1β+IFN-γ upregulates the expression of the beta cell IL-17A receptor via the transcription factors nuclear factor-κB (NF-κB) and signal transducer and activator of transcription (STAT) 1 . This raises the possibility that beta cell apoptosis in type 1 diabetes is initially triggered by Th1 cells and macrophages through the production of IL-1β and IFN-γ, and by other mechanisms, these processes then being followed by the additional pro-apoptotic effects of IL-17A-secreting Th17 cells . As discussed above, the early events leading to the build-up of insulitis involve local production of chemokines, raising the possibility that IL-17A, apart from contributing to beta cell apoptosis, also modulates the production and release of chemokines by islet cells. To test this hypothesis, we characterised the pattern of chemokine expression induced by IL-17A, alone or together with IL-1β, IFN-γ and TNF-α, in human and mouse islets of Langerhans. The data obtained suggest that IL-17A increases the expression and release of key chemokines, in part via activation of STAT1. They also suggest the intriguing possibility that IL-17A contributes to the pathogenesis of type 1 diabetes by two mechanisms, namely exacerbation of beta cell apoptosis and increased local production of chemokines, thus potentially aggravating insulitis. Human islet collection and handling were approved by the local Ethics Committee in Pisa, Italy. Wild-type C57BL/6 mice were purchased from Harlan (Horst, the Netherlands). Stat1 knockout (KO) mice (on a C57BL/6 background) were a kind gift from David Levy (New York University, New York, NY, USA) . All experimental procedures in mice were approved and performed in accordance with the Ethics Committees of the KU, Leuven, Belgium. Human islets from 18 non-diabetic donors were isolated in Pisa using collagenase digestion and density gradient purification . The donors (ten women, eight men) were 65 ± 3 years old and had a BMI of 26 ± 1 kg/m2 (mean ± SEM) (electronic supplementary material [ESM] Table 1). Beta cell purity, as evaluated by immunofluorescence for insulin (ESM Table 2), was 56% ± 4% (mean ± SEM). The islets were cultured in M199 culture medium containing 5.5 mmol/l glucose and sent to Brussels within 1 to 5 days after isolation, where they were dispersed and cultured in Ham’s F-10 medium containing 6.1 mmol/l glucose (Invitrogen Life Technologies, Paisley, UK) as described [3, 23]. Mouse islets were isolated from 2- to 3-week-old mice and cultured as previously described [21, 24]. After a 24 h recovery period, 150 islets per condition were exposed to cytokines in 1 ml medium. The rat insulin-producing INS-1E cell line, kindly provided by C. Wollheim (University of Geneva, Switzerland) , was maintained in RPMI 1640 GlutaMAX-I medium (Invitrogen) . The human beta cell line EndoC-βH1, kindly provided by R. Scharfmann (University of Paris, Paris, France) , was cultured in DMEM containing 5.6 mmol/l glucose, as described . The same medium, but with 2% (vol./vol.) FBS was used for cytokine treatment. The following cytokine concentrations were used, based on previous dose–response experiments performed by our group [28, 29, 30, 31, 32]: (1) recombinant human IL-1β (R&D Systems, Abingdon, UK), 10 or 50 units/ml, respectively, for INS-1E cells or human islet cells, mouse islets and EndoC-βH1 cells; (2) recombinant rat IFN-γ (R&D Systems), 100 units/ml for INS-1E cells; (3) murine IFN-γ for mouse islets and human IFN-γ for human islet cells or EndoC-βH1 cells (Peprotech, London, UK), 1,000 units/ml; (4) recombinant murine TNF-α (Innogenetics, Gent, Belgium) for all cell types, 1,000 units/ml; and (5) recombinant murine IL-17A and human IL-17A (R&D Systems) for INS-1E cells and mouse islets, or for human islet cells and EndoC-βH1 cells, 20 ng/ml. Culture supernatant fractions were collected for chemokine measurements. The short interfering RNAs (siRNA) used in the study are described in ESM Table 3. The optimal concentration of siRNAs used for cell transfection (30 nmol/l) was established previously [23, 33]. Cells were transfected using Lipofectamine RNAiMAX lipid reagent (Invitrogen) as previously described [33, 34]. Allstars negative control siRNA (Qiagen, Venlo, the Netherlands) was used as negative siRNA control (siCTRL). This siCTRL does not affect beta cell gene expression or insulin release, compared with non-transfected cells . After 16 h of transfection, cells were cultured for a 48 h recovery period before exposure to cytokines. The percentage of viable, apoptotic and necrotic cells was determined after 15 min incubation with DNA-binding dyes propidium iodide (5 μg/ml) (Sigma-Aldrich, Poole, UK) and Hoechst dye 33342 (5 μg/ml) (Sigma-Aldrich). Determination was by two independent researchers, one of whom was unaware of sample identity [35, 36]. A minimum of 600 cells were counted for each experimental condition. In some cases, apoptosis was also confirmed by caspase-3 cleavage. Poly(A)+ mRNA was isolated from human islet cells or EndoC-βH1 cells using a kit (Dynabeads mRNA Direct; Invitrogen) and reverse-transcribed as previously described [7, 36]. The real-time PCR amplification reaction was done using iQ SYBR Green Supermix on a LightCycler instrument (Roche-Diagnostic, Indianapolis, IN, USA) and the concentration of the gene of interest was calculated as copies per μl using the standard curve method [36, 37]. Gene expression values in human islets were corrected by the housekeeping gene β-actin, the expression of which is not modified in these cells by cytokine treatment [8, 23], and normalised to the highest value in each individual experiment. The primers used in this study are provided in ESM Table 4. Total RNA from mouse islets was extracted using a kit (RNAeasy Micro; Qiagen). For cDNA synthesis, 100 ng was reverse-transcribed using Superscript II Reverse Transcriptase and oligo d(T)16 (Invitrogen). Real-time PCR was performed with Fast SYBR Green Master Mix and gene-specific primers or with TaqMan Fast Universal Master Mix and gene-specific primers plus TaqMan probe (Applied Biosystems-Life Technologies, Foster City, CA, USA) (ESM Table 4). PCR amplification was carried out in a real-time PCR system (StepOnePlus; Applied Biosystems). Relative RNA expression was calculated using the comparative cycle threshold method (Ct), after normalisation to the geometrical mean of three housekeeping genes (Rpl27, Hprt and β-actin). The human chemokines, chemokine (C-X-C motif) ligand (CXCL) 1 (GRO-α), CXCL8 (IL-8), chemokine (C-C motif) ligand (CCL) 20 (MIP-3α), CCL2 (MCP-1), CXCL10 (IP-10), CXCL9 (MIG) and CCL5 (RANTES) were measured using an ELISA array kit (Custom Multi-Analyte kit; SABiosciences, Frederick, MD, USA) . This is a semi-quantitative assay that does not include a standard curve. Absorbance at 450 nm was measured, corrected by readings at 570 nm and normalised to the geometric mean of β-actin mRNA expression to allow an approximate correction for the amount of islet cells in the preparations. Final results were expressed as arbitrary units. Release of the human chemokines CXCL1, CCL20, CXCL10 and CXCL9 was subsequently measured after STAT1 knockdown (KD) using quantitative ELISA kits (Quantikine; R&D Systems). Release of the mouse chemokines CXCL1 and CCL20 was measured in wild-type and Stat1 KO islets using a quantitative ELISA kit (Quantikine; R&D Systems) and data obtained were normalised to the number of islets. C57BL/6 islets were cultured for 24 h as described above and the supernatant fractions collected. For the chemotaxis assay, thioglycolate-elicited peritoneal cells from 8-week-old C57BL/6 mice were seeded in the top chamber of transwell plates (106 cells per well; 5.0 μm) (Costar; Corning, Corning, NY, USA), while conditioned islet medium was added to the lower chambers of the transwell plates. Following an incubation time of 2 h at 37°C in 5% CO2, the cells in the lower chamber were collected and stained for CD45 using a directly conjugated antibody (eBioscience, San Diego, CA, USA). To minimise non-specific binding, the cells were first pre-incubated with anti-CD16/CD32 (clone 2.4G2; eBiosience). Dead cells were excluded by using Fixable Live/Dead Yellow stain (Invitrogen). The absolute number of migrated leucocytes was determined by CountBright absolute counting beads (Invitrogen) according to the manufacturer’s specifications. Data acquisition was performed on a Gallios™ flow cytometer (Beckman Coulter, Brea, CA, USA) and Kaluza™ software (Beckman Coulter) was used for data analysis. Cells were washed with cold PBS and lysed using Laemmli buffer. Total protein was extracted and resolved by 8–10% SDS-PAGE, transferred to a nitrocellulose membrane and immunoblotted with the specific antibodies for the protein of interest (ESM Table 2) as described . The intensity values for the proteins were corrected by the values of the housekeeping protein α-tubulin. INS-1E cells were co-transfected using Lipofectamine 2000 (Invitrogen) with the internal control pRL-CMV encoding Renilla luciferase (Promega, Madison, WI, USA) and a luciferase promoter–reporter construct containing five NF-κB consensus binding sites (pNF-κB-Luciferase) (BD Biosciences, Palo Alto, CA, USA). Luciferase activities were assayed after 4 h of cytokine treatment. Whole human islets were collected, fixed in formaldehyde and paraffin-embedded. Sections (5 μm thick) were subjected to antigen retrieval by boiling in 10 mmol/l citrate buffer (pH 6) for 10 min. After overnight incubation at 4°C and with primary antibodies against the chemokines CXCL1, CXCL10 and CCL20, slides were double-stained for 1 h and at room temperature with an anti-insulin or an anti-glucagon antibody. Alexa Fluor fluorescent secondary antibodies (Molecular Probes-Invitrogen, Leiden, the Netherlands) were applied for 1 h at room temperature (ESM Table 2). Immunofluorescence was visualised on a Zeiss microscope equipped with a camera (Zeiss-Vision, Munich, Germany), as previously described . Data are expressed as mean ± SEM. A significant difference between experimental conditions was assessed by ANOVA followed by a paired Student’s t test with Bonferroni’s correction. A value of p < 0.05 was considered statistically significant. We have previously shown that IL-17A augments apoptosis in human islet cells or rat beta cells exposed to IL-1β+IFN-γ or TNF-α+INF-γ . Here, these findings were expanded by the observations that IL-17A increased apoptosis induced by IL-1β+IFN-γ in rat INS-1E cells, as judged by nuclear dyes and caspase 3 cleavage (Fig. 1a–c); IL-17A also augmented cell death in mouse islet cells exposed to IL-1β+IFN-γ or TNF-α+INF-γ, this effect being particularly marked in the case of TNF-α+INF-γ, with an IL-17A-induced 84-fold increase in cell death compared with TNF-α+INF-γ alone (Fig. 1d). On the other hand, IL-17A alone at 20 ng/ml did not increase beta cell death (Fig. 1d). The effects of IL-17A were further investigated in a dose–response experiment in mouse pancreatic islets (experimental conditions as in Fig. 1d). The percentage of apoptotic cells was 2.3% ± 0.6%, 3.2% ± 0.6% and 1.8% ± 0.2% after exposure to 20, 100 and 200 ng/ml IL-17A, respectively, a finding that was similar to the percentage of apoptotic cells observed in control (non-cytokine treated) islet cells, i.e. 3.5% ± 1.2% (n = 4) (data not shown). These observations confirm that IL-17A alone, even at high concentrations, is not toxic to primary beta cells. We also observed that IL-1β+IFN-γ induced apoptosis in human EndoC-βH1 cells and that this was mildly increased by IL-17A (Fig. 1e). To our knowledge this is the first evidence that this human cell line is sensitive to cytokine-induced apoptosis. IL-17A induced a mild increase in the expression and release of CXCL1, CXCL8 and CCL20, and augmented chemokine expression and release induced by TNF-α+INF-γ (and also in most cases by IL-1β+IFN-γ) in human islets (Fig. 2a–f). The stimulatory effects of IL-17A were less marked in the case of CCL2 and CXCL10 (Fig. 2g–j), and were not present for CCL5 and CXCL9 (data not shown). Similar to these observations, IL-17A also exacerbated cytokine-induced CXCL1 and CCL20 expression in mouse islets (ESM Fig. 1a–c). When added to TNF-α+INF-γ, IL-17A also augmented the chemotaxis of live CD45+ leucocytes (ESM Fig. 1d). Immunohistochemistry indicated detectable protein expression of CXCL1, CCL20 and CXCL10 in islets exposed to IL-1β+IFN-γ and TNF-α+INF-γ, with or without IL-17A, but not in control islets or islets treated with IL-17A alone (data not shown). Double immunofluorescence confirmed that beta cells were at least in part the source of chemokine production after cytokine treatment, as shown by the presence of cells double-positive for insulin and CXCL1, CCL20 or CXCL10 (Fig. 3c, f, i). Interestingly, while expression of CXCL1 and CXCL10 was diffuse in the cytosol, CCL20 staining was more ‘punctiform’ in appearance. The percentage of cells double-positive for insulin and chemokines was 60% for CXCL1, 35% for CCL20 and 70% for CXCL10, indicating that not all beta cells expressed the chemokines. It has been previously shown in other cell types that IL-17A activates the transcription factor, NF-κB [39, 40]. NF-κB is important for chemokine expression and cell apoptosis in beta cells exposed to IL-1β+IFN-γ [2, 28]. The addition of IL-17A, however, neither increased IκBα degradation (an early step in NF-κB activation) (ESM Fig. 2a, b), nor augmented IL-1β+IFN-γ-induced activation of a luciferase reporter containing several NF-κB binding sites (ESM Fig. 2c), arguing against a role for NF-κB as a mediator of IL-17A effects in beta cells. STAT1 is another master regulator of cytokine-induced pancreatic beta cell apoptosis and chemokine production [21, 41]. The addition of IL-17A to IL-1β+IFN-γ increased STAT1 phosphorylation and interferon regulatory factor 1 (IRF-1) (a downstream STAT1 transcription factor) expression at earlier time points (2–6 h) (Fig. 4a–c), which led us to perform additional experiments where IL-17A and other cytokines were added to beta cells with blocked STAT1 signalling. Since STAT1, but not IRF-1, upregulate chemokine expression , these experiments focused on STAT1. STAT1 KD in INS-1E cells (ESM Fig. 3a, b) significantly decreased cell death after IL-1β+IFN-γ and TNF-α+IFN-γ treatment, with or without the addition of IL-17A (Fig. 5a). The percentage of inhibition of cell death achieved by the blockade of STAT1 in INS-1E cells (Fig. 5a) was similar in the presence or absence of IL-17A, suggesting that inhibition of this transcription factor mainly prevents the pro-apoptotic signalling provided by IFN-γ [21, 41]. To decrease STAT1 expression in dispersed human islets, we tested three different siRNAs in HeLa cells (ESM Table 3). The best results were obtained with siSTAT1#2 (ESM Fig. 3c, d), with which all subsequent experiments were performed. An 80% and 60% decrease of STAT1 and IRF1 mRNA expression, respectively, was observed in human islets transfected with STAT1 siRNA and subsequently treated with IL-1β+IFN-γ or TNF-α+IFN-γ, with or without the addition of IL-17A (ESM Fig. 3e, f). STAT1 KD reduced apoptosis to the same extent in dispersed human islet cells exposed to IL-1β+IFN-γ and IL-1β+IFN-γ+IL-17A (Fig. 5b). There was also a non-significant trend for a decrease in apoptosis following treatment with TNF-α+IFN-γ with or without IL-17A (Fig. 5b). We next examined the effects of STAT1 deletion by using islets isolated from Stat1 KO mice. After 48 or 96 h of IL-1β+IFN-γ or TNF-α+IFN-γ treatment, with or without addition of IL-17A, protection against cytokine-induced apoptosis was complete (Fig. 5c, d), confirming here that, as shown elsewhere , STAT1 is a crucial mediator of beta cell apoptosis induced by cytokine mixtures containing IFN-γ. Blocking the STAT1 pathway in human islets reduced the expression of CXCL9 and CXCL10 at the mRNA (Fig. 6a, c) and protein levels (Fig. 6b, d), and also decreased mRNA expression of these chemokines in mouse islets (Fig. 6e, f). siSTAT1 also decreased CXCL8 (also known as IL8) mRNA expression in human islets exposed to TNF-α+IFN-γ+IL-17A (ESM Fig. 4a). On the other hand, CXCL1 and CCL20, the chemokines most upregulated by IL-17A, (Figs 2 and 7), showed in most cases a paradoxical increase in expression following inhibition of STAT1 in human islets (Fig. 7a–d). This was confirmed in islets isolated from Stat1 KO mice, where the absence of STAT1 led to a major increase in CXCL1 expression (Fig. 7e, f) and a less marked increase in CCL20 in the presence of IL-1β+IFN-γ+IL-17A, TNF-α+IFN-γ or TNF-α+IFN-γ+IL17A (protein level only) (Fig. 7g, h). We have previously shown that IRF-7 plays an important role in the regulation of chemokine expression by TNF-α+IFN-γ , but this does not explain the present observations, as STAT1 KD decreased IRF-7 expression (ESM Fig. 4b). Taken together, these findings indicate a complex regulation of chemokine expression in human and mouse pancreatic islets, which may contribute to different ‘chemokine signatures’ depending on the proinflammatory stimulus delivered to the islet cells and the downstream transcription factors activated. During the progression of insulitis in type 1 diabetes, pancreatic beta cells are probably exposed to changing groups of cytokines. Recent studies indicate an increased presence of Th17 cells among circulating T cells and in the pancreatic islets of type 1 diabetes patients [16, 17, 18, 19]. Th17 cells secrete the cytokine IL-17A, which we and others have shown to exacerbate IL-1β+IFN-γ- and TNF-α+IFN-γ-induced apoptosis in MIN6 cells and human islets [16, 17]. In the present study, we confirmed that IL-17A augments pro-apoptotic signalling by IL-1β+IFN-γ and TNF-α+IFN-γ in mouse islets, rat INS-1E cells and the human insulin-producing cell line EndoC-βH1, extending our previous observations in human islets and rat beta cells . The use here of a large number of independent human islet preparations, mouse islets and clonal cell lines is particularly important, as it allows solid conclusions regarding the deleterious effects of IL-17A in the context of isolated/clonal beta cells and beta cells studied together with other islet cells. However, a limitation of the present study is its purely in vitro nature, with the isolated islets or beta cells studied being separated from the immune system. It will therefore be important to confirm the present findings in in vivo models or, preferably, in pancreatic or islet samples from type 1 diabetes patients. Apart from inducing cell death, cytokines also trigger the release of chemokines by pancreatic islets, contributing to the attraction and activation of more immune cells [2, 10, 11]. The chemokine ‘signature’ of pancreatic islets seems to vary depending on the cytokine stimulus provided. For instance, the pattern of chemokines induced by IL-1β+IFN-γ in pancreatic beta cells is markedly different from that induced by TNF-α+IFN-γ . We showed here that IL-17A alone induces a mild increase in expression of CXCL1, CXCL8, CCL2 and CCL20, in addition to its stimulatory effect on human islets exposed to IL-1β+IFN-γ and TNF-α+IFN-γ. These additive effects are most marked in the case of TNF-α+IFN-γ, affecting, preferentially, the chemokines CXCL1, CXCL8, CXCL10 and CCL20. A similar pattern of chemokine induction was observed in mouse islets. Immunofluorescence studies, including co-localisation with insulin, confirmed that human beta cells are, at least in part, the source of CXCL1, CCL20 and CXCL10 production in human islets. Chemokines play an important role in the recruitment of leucocytes, monocytes and activated T cells to areas of inflammation in autoimmune diseases [43, 44]. CXCL1 is important in the recruitment of neutrophils, which infiltrate the pancreas and are present in low numbers in the periphery in diabetic patients . CCL2 expression is increased in the islets of prediabetic female NOD mice , and transgenic overexpression of CCL2 in beta cells stimulates insulitis and progression to diabetes in mice with a B6D2 background . On the other hand, isolated transgenic expression of CCL2 in NOD mouse beta cells decreases autoimmune-mediated beta cell destruction via induction of tolerogenic dendritic cells, suggesting a context-dependent effect of these proteins . NOD mouse islets also show increased expression of CCL20 and CXCL10, with a peak at around 10 to 12 weeks of life, which precedes the outbreak of diabetes by 2 to 4 weeks. CCL20 is the only ligand for CCR6, which is expressed in Th17 and regulatory T cells [10, 48]. CXCL10 and CXCL9 are present in pancreatic islets from type 1 diabetic patients [11, 48], while infiltrating lymphocytes express the CXCL10 receptor, C-X-C chemokine receptor type 3 , suggesting a ‘dialogue’ between chemokine-producing islet cells and the invading immune cells. In NOD mice, the severity of insulitis is reduced in IL-17- or IL-17/IFN-γ receptor-deficient animals , indicating the importance of IL-17A in the attraction of immune cells. As suggested by the present data, this may be mediated via increased production of chemokines. The mechanisms behind the proinflammatory and pro-apoptotic effects of IL-17A in beta cells remain to be determined. Our present findings rule out a major role for NF-κB and suggest that STAT1 mainly mediates the effects of IFN-γ, but not those of IL-17A. Indeed, KD or KO of STAT1 in human or rodent beta cells prevents apoptosis and the expression of CXCL9 and CXCL10 to the same extent in cells exposed to IL-1β+IFN-γ and TNF-α+IFN-γ, with or without IL-17A. On the other hand, STAT1 seems to have an inhibitory effect on expression levels of the chemokines CXCL1 and CCL20. This may contribute to the generation of specific ‘chemokine signatures’ depending on the original stimuli and downstream transcription factors activated. It has been shown that IL-17A modulates inflammation in lupus or rheumatoid arthritis via downregulation of the microRNA miR-23b , but we were not able to confirm this finding in our model (data not shown). In conclusion, the present findings suggest that IL-17A contributes to the expression and secretion of chemokines by human and rodent islet cells, but the ultimate mechanisms behind the effects of IL-17A in beta cells remain to be clarified. Our observations indicate that IL-17A contributes to the pathogenesis of type 1 diabetes by two mechanisms, namely the exacerbation of beta cell apoptosis and increased local production of chemokines, thus potentially aggravating insulitis. We thank M. Igoillo-Esteve, Laboratory of Experimental Medicine-Université Libre de Bruxelles (ULB), for fruitful discussions and help with the analysis of human chemokines by ELISA. We also thank L. Ladriere, ULB, for help with the dispersion of human islets. We are grateful to the personnel from the ULB including I. Millard, A. Musuaya, M. Pangerl and S. Mertens. Thanks also to D. Lambrechts from the Laboratory of Clinical and Experimental Endocrinology (KU Leuven) for excellent technical support. This work was supported by grants from the Fonds National de la Recherche Scientifique (FNRS) Belgium, the Communauté Française de Belgique-Action de Rechercher Concertéés (ARC), the European Union (projects NAIMIT and BetaBat, in the Framework Program 7 of the European Community) and the KU Leuven (Geconcerteerde Onderzoeksactie 2009/10 and 12/24). F.A. Grieco is a recipient of a postdoctoral fellowship from NAIMIT and was supported by a 1 year postdoctoral fellowship from the University of Siena and from Società Italiana di Diabetologia (Fo.Ri.SID) ONLUS, Italy. DLE, FAG, FM, FD, PM and CM contributed to the study concept and design. FAG, FM, FV, IS, OV, LM, DR, HK and LO acquired the data. DLE, LO and CM supervised the study. FAG and DLE drafted the manuscript. All authors revised the article and approved the final version to be published.